CTM Festival's "Eishalle" installation is an ice skating rink at Halle am Berghain that will close on Sunday, February 10 2019. One of the most talked about events of this year’s CTM Festival has been its “Eishalle” installation at Berghain. The idea is simple: It’s an ice skating rink inside the club’s massive Halle am Berghain room that’s open throughout the week. Each night, the installation plays host to DJs of various musical affiliations. Despite the initial hype, reactions to the event have been mixed so far, with most people disappointed by the poor skating experience provided by the rink’s synthetic ice. We sent journalist and illustrator Whitney Wei to find out if the critics are right. 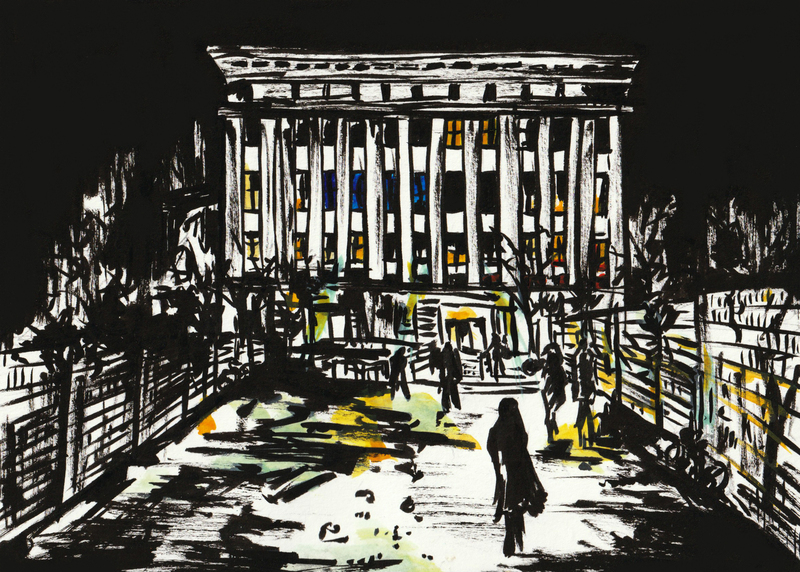 It’s no question that Berghain has successfully established itself as a formidable brand name in Berlin’s vast club landscape and beyond. It is perhaps the only place in the world where long-term partners willfully abandon one another at the door; fearful tourists actively disguise their true selves in order to gain entrance; and taking a selfie in its hallowed halls will lead to instant expulsion. Berghain’s “no photos” policy and near-mythical reputation secures its international appeal. But it’s these two very factors that contributed to the audacious mediocrity that was CTM Festival’s Eishalle am Berghain, a project that the festival itself has stated on a Facebook announcement began as a “tongue-in-cheek attempt to break up the seriousness,” only to gain a hype of its own, and nearly overshadow the full ten days of programming. If the concept of practicing your triple axels within Berghain’s gargantuan concert venue didn’t appeal to you, the least the event did was spark the imagination. Of course, no photos were allowed of the actual ice rink; so some—like myself—took reference from Google image search, interpolating their own wild assumptions on each tiny thumbnail image. Others, ignorant to the technical and financial limitations of maintaining a rink over the course of its seven-day run, may have pictured the concrete expansion somehow completely coated, wall-to-wall, in frozen ice. Still others, familiar with CTM Festival and Berghain’s standard for excellence, simply trusted in its execution. After all, if the club was Sunday church for some people, why couldn’t its concert venue also be an ice-skating rink? Despite what the rumors may have you believe, Eishalle am Berghain was not a complete disappointment. The space itself is beautiful. Industrial and vast with a massive Eye of Horus casting its ambivalent gaze over the proceedings below, the concert venue has a singular grandeur that’s better understood in other contexts. Last Sunday, Creamcake, a forward-thinking Berlin party collective known for its events at OHM, took over DJ duties, appointing residents Alobhe, CORIN, and Larry to helm the booth. Experimental techno with occasional guilty pleasure club edits of Cardi B’s “Bodak Yellow” and Rihanna’s “Needed Me” played to a sparse audience. The music selection, as with all CTM Festival’s events, was its strength, as was artist Christopher Bauder’s light installation FREQUENCIES. Composed of hundreds of pixels, the centipede-like 20-meter display translated each sound wave into synchronized ripples of color. Rihanna’s voice, for instance, drenched the Halle a deep crimson red—not far from the hue of Fenty Beauty’s “Stunna” lip paint. 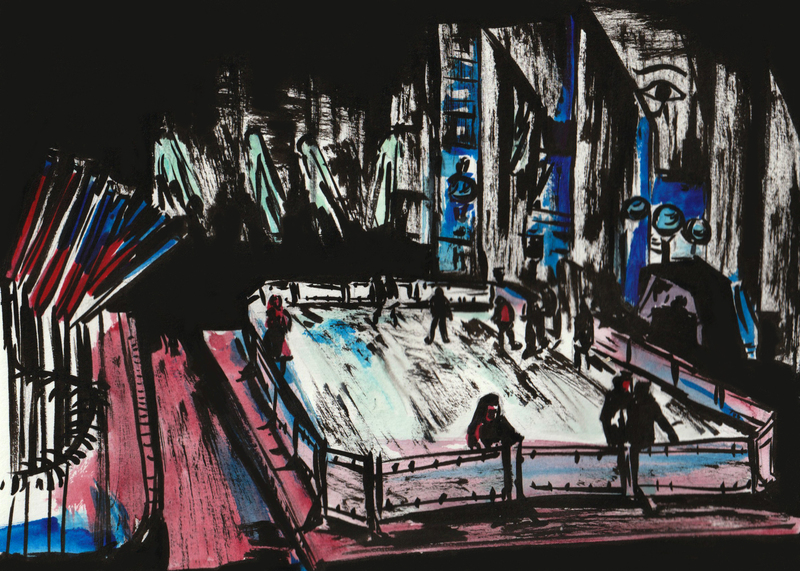 Unfortunately, the installation’s proximity to the synthetic ice rink only further illuminated the thoroughly disgruntled expressions of the skaters—or rather, in this case, shufflers—aimlessly circling underneath its luminous arms. The light, combined with the elevated seating directly adjacent to it, meant that even the most tenacious of patrons who were already predestined to fall multiple times given the rink’s suboptimal conditions, but still scuffled furiously around to get their money’s worth, couldn’t even do so with a modicum of peace. Instead, they flailed under the watchful eyes of their equally disenchanted peers who gulped down mugs of mulled wine like a half-hearted consolation prize—one that, yes, was delicious and reasonably priced, but didn’t make up for a squandered Sunday evening. But at least CTM Festival provided fleece blankets! “It was super boring and it wasn’t even working!” one 26-year-old student complained to me across the din, as he returned his red skates. “It was weirdly dry and sandy.” Inspecting the 18 x 7 meter rink myself, he was not wrong. Marred with dirt and abrasions, each “ice” sheet interlocked horizontally together in dovetail, resulting in an uneven and resistant surface, dull ice skates, and an altogether less than desirable skating experience. Whitney Wei is a cultural journalist and visual artist based in Berlin. Her writing intersects fashion, music, and nightlife, and her work has appeared in Vogue US, The Guardian and Pitchfork.